Bill Moyers exposes the tactics used by the Bush administration to sell the American people the war in Iraq. 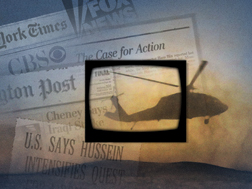 Why did the press believe the Bush administration when it came to the war in Iraq? This program explores how the Bush administration was able to sell the idea of the war in Iraq, first to the press, which then helped the administration to sell this idea to the general public. Normally the press is supposed to help the American people to avoid propaganda by exposing any dishonest claims by politicians. However, when it came to the war in Iraq, the Bush administration was able to beguile the press into supporting their claims. The press did not investigate the claims put forward by the Bush administration and this is part of the reason why the American people were led into a war under false pretenses. The Bush administration managed to keep the press believing their version of the events which led up to the 2003 invasion for a long time. Why is it that the press was unable to expose the truth earlier? If the press had managed to expose the truth earlier then they might have been able to save the American people the pain that came from fighting a war when they were led to this war with false claims.